The Cannon Courier announces the hiring of veteran Middle Tennessee journalist Tony Stinnett as the newest member of its editorial staff. Stinnett will serve as co-editor of the Courier, sharing duties with current editor Kevin Halpern. "We are pleased to have someone of Tony's experience and background on our staff as we strive to provide readers of the Courier with the best Cannon County news coverage possible," Halpern said. 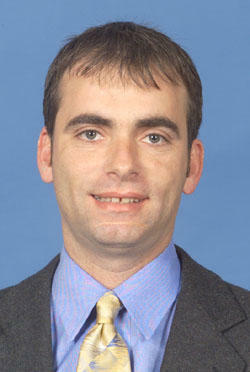 Stinnett is a 1990 graduate of MTSU were he earned a Bachelor of Science, Mass Communications degree. He most recently served as assistant athletic communications director at MTSU, where he was the primary contact for men's basketball, men's and women's golf and assisted with promoting the Blue Raiders' football team. He worked for The Daily News Journal from May 1988 to Jan. 2004. Stinnett performed a variety of duties during his career with Daily News Journal, ranging from MTSU beat writer for a six-year span upon the football program's move to Division I-A football in 1999, as well as serving as prep editor during an eight-year span. He assisted with the concept of the annual DNJ All-Sports Awards Prep Banquet in 1994. He became one of the youngest editors in the state when was named editor of The Rutherford Courier in Smyrna, Tenn., at age 23 in Aug. 1990. He was responsible for all aspects of producing the weekly newspaper. The Rutherford Courier earned six citations by the Tennessee Press Association in Stinnett's first year, including first place for General Excellence - the highest honor awarded at the annual TPA Banquet. It was the newspaper's first citation for General Excellence. He has also received numerous awards/honors from TSWA and TPA for sports writing, event writing, news, features and editorials. Stinnett has coached youth baseball in Rutherford County for 20 years, taking teams to five national championships and two regionals. In 2009, Stinnett was coach of the Optimist American Junior League All-Stars that won the Tennessee State Championship for the first time in the league's 54-year history. Stinnett can be reached by e-mail at stinnett@cannoncourier.com.